Home / Preg-U / Science / Does an Epidural Lead to a C-sxn? That Depends. Previous: Who should have access to Non-invasive Prenatal Testing? Everyone. Roughly 2 out of 3 laboring women in the U.S. will get an epidural. As a highly effective form of pain relief during labor, it’s no wonder that the epidural is enormously popular. But along with the epidural, comes the controversy. And at the heart of the controversy, the idea that epidurals raise the chances of a C-section. The case levied goes something like this: Epidurals can kick-start an “intervention cascade”–a series of medical interventions that culminates in an otherwise avoidable C-section. Hearing such statements, women are understandably concerned. The rate of C-sections has skyrocketed in the U.S., climbing from 5% in 1970 to 32% in 2015. And with few doctors willing to attempt vaginal deliveries after a C-section, once you have a C-section, you are virtually guaranteed a C-section for any subsequent births. And so the message for the mom seeking pain relief is this: get through labor med-free — if not for yourself, for your baby. In some mom circles, the epidural is now so stigmatized that women who get one experience widespread judgment and shaming. 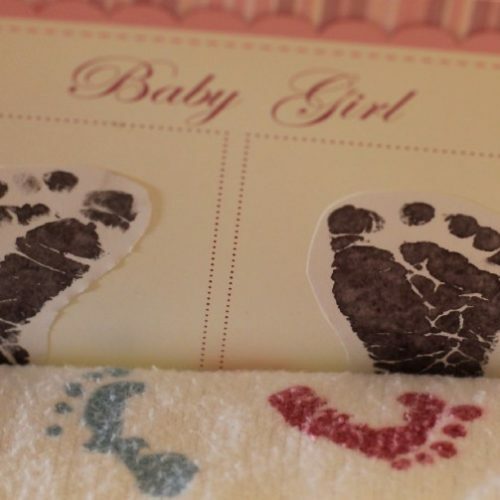 Some women suffer lasting guilt over their “failure” to achieve a natural birth. While the case against an epidural sounds compelling, and while fears of unnecessary C-sections are understandable, the judgment and the guilt and, yes, dare I say, the controversy over the epidural itself is almost certainly misplaced. Because, contrary to what you may have heard, nearly every study conducted since the early 1990s has shown that, in and of themselves, epidurals do not raise your chances of a C-section. That’s right: Compared to opiate pain relief or to unmedicated labor, women laboring with epidurals appear to have no higher rates of C-sections. Even more surprisingly, studies find no impact even in situations where epidurals are likely to slow labor down, like when given before the onset of active labor or when women have to lie on their backs after receiving one. But, there is one important exception – how your hospital and care team treat “slow labor”. Epidurals do not raise your chances of a C-section. Let’s start at the beginning: Why do we continue to hear that epidurals do raise their risk of a C-section? Despite the overwhelming evidence, many natural birth advocates and some doctors remain convinced that epidurals do lead to C-sections, at least under some circumstances and for some groups of pregnant women, such as first-time mothers and women whose labors are induced. Fact #1: Several observational studies in the 1980s and early 1990s found that women who received epidurals had more than double the chances of a c-section. Since then, randomized controlled trials (RCTs) have found no impact. Fact #2: Women who receive epidurals do have longer labors, especially longer second stages (from full dilation to delivery), and are more likely to run a fever. Since these are risk factors for C-sections, the RCTs’ findings seem odd. Why did observational studies in the 1980s and early 1990s show a strong impact on C-sections while recent randomized trials show none? One simple possibility is that observational studies, a type of study notoriously susceptible to bias, were flawed. These studies compared women who received epidurals with those who did, and this is not an “apples to apples”, fair comparison. Women who get epidurals typically have had longer labors and report greater pain. And women with more difficult labors may have higher C-section rates, regardless of their chosen form of pain relief. Bias is not the only possibility. Epidurals have also changed since the 1980s. Modern epidurals are “lighter”; they contain lower doses of anesthesia than those used in the 1980s and early 1990s. Lighter epidurals are less likely to cause a motor blockade (a complete loss of movement below the waist), and thus less likely interfere with a woman’s ability to push. Changes in hospital procedures may also factor in. The C-section rates have soared since the 1970s, from less than 1 in 5 to nearly 1 in 3. Perhaps epidurals were once the tipping point for women on the edge of getting a C-section, whereas now, with the overall rate higher, those women receive a C-section regardless of their chosen form of pain relief. A final possibility (the one many natural birth advocates favor): Randomized controlled trials (RCTs) simply get it wrong. Summing up: The observational studies are flawed. The RCTs are flawed. What are we to make of this muddle? Fortunately, there’s a third set of studies to consider: naturalistic studies. These studies look at C-section rates in places where epidurals suddenly become available. Consider the findings of study conducted at a military hospital based in Hawaii, the Tripley Army Medical Center. Before 1993, less than 1% of women delivering at the Tripley Army Medical Center received epidurals. Then, in 1993, the Department of Defense mandating that all US military hospitals offer epidurals on-demand. Within a year, the rate of epidural labour analgesia jumped to 80%. So how did this dramatic rise affect the hospitals C-section rate? It didn’t. The overall c-section rate remained unchanged (19.0% vs 19.4%). Well, not quite. Let’s turn to the second controversy. Epidurals slow down labors, so why wouldn’t they raise the chances of a C-section? Epidurals are notorious for prolonging labor. On average, the numbers do not look so bad: Epidurals add an average of 42 minutes to the first-stage of labor, and an average of 14 minutes to the second stage, according to a recent meta-analysis. But these averages tell only part of the story. For a significant minority of women, epidurals slow labor down not by minutes but by hours. They stretch out pushing time by 2 hours for many women. And for 1 woman in 20, they will prolong pushing by 4 to 6 hours. Your risk for C-sxn could depend on whether or not your doctor understands this graph. 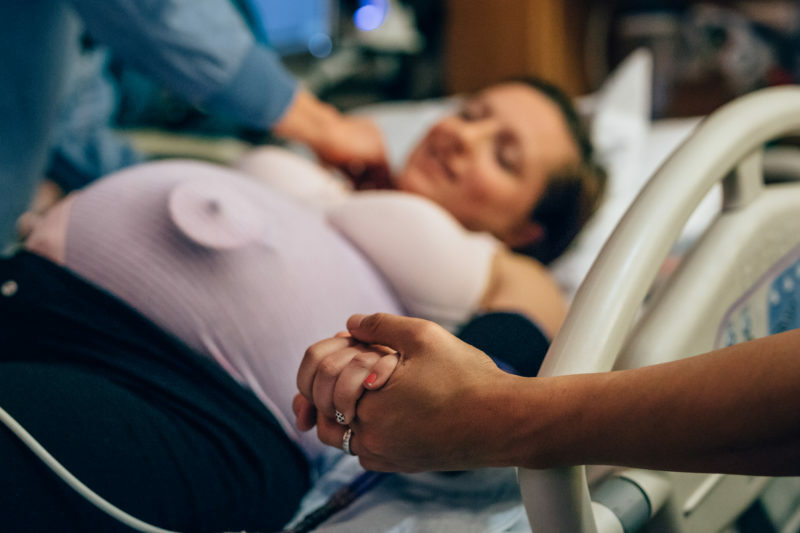 Given these facts, a woman’s care team needs to consider how an epidural is affecting your labor progress and set their expectations of progress accordingly. If they fail to do so, you could be misdiagnosed with failure to progress, one of the most common indications for a c-section among first-time mothers. This is a real risk. 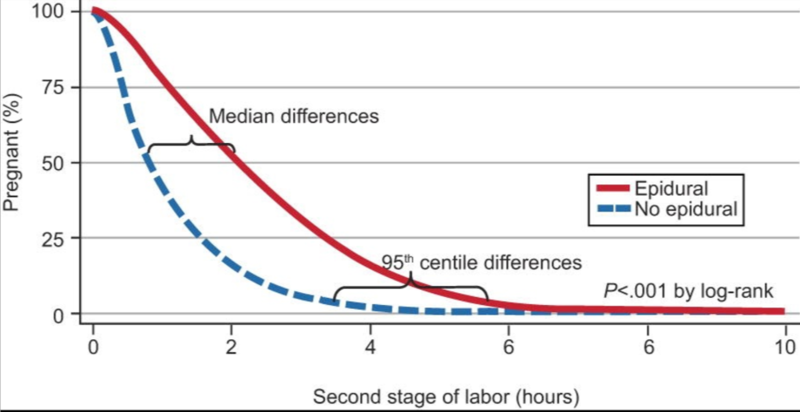 About half of first-time cesareans still occur before 6 cm dilation, despite the American College of Obstetricians and Gynecologists now advocates against this practice, even in cases where an early labor lasts over 20 hours. Epidurals do slightly raise your chances of a fever and of needing a vacuum or forceps-assisted delivery. And epidurals do slow labor down. This second point leads to the most important conclusion: It is the practices around pain relief, not the pain relief itself, that seem to matter most for avoiding unnecessary C-sections. * (Want to figure out your hospital’s rate? This website lists hospital C-section rates by state). At the end of the day, pain relief vs. med-free is YOUR choice. This choice is not a selfish one. It does not pit your needs against your baby’s. If and when an epidural provokes an intervention cascade it stems from systematic problems with labor management, not with you. You know your situation and your context best. If you feel that an epidural is best for YOU, get the epidural. If you feel that an epidural might not be best in your situation, master other pain relief techniques and rock your med-free birth. Interested in learning more? Click here to check out Preg-U to explore more!